Polish T-Mobile Ekstraklasa as it is called due to the sponsor reasons is the top football division in Poland, founded in 1927. T-Mobile became an official sponsor of the Polish first league in 2011 with the deal reported to be worth 6.3 million euros. The Ekstraklasa (formed as Liga Piłki Nożnej) was founded in 1927 even though the Polish Championships and the Polish Football Federation had been in existence since 20 December 1919, a year after the independence of Poland. Throughout the history a total of 79 clubs have played in the Polish first division, 16 teams have won the title. Two clubs with most titles are Gornik Zabrze and Ruch Chorzow with 14 titles, the current champions are Lech Poznan who won their seventh title in 2014/15. The Ekstraklasa is contested by 16 clubs, the season starts in late July and ends in May or June the following year. During the course of the season, each club plays the other twice for a total of 30 games. From 2013/14 season the champion is not decided after the 30 games but there is also the second phase of the competition. After 30 games clubs are divided into two groups – playoff and playout –, top eight clubs are playing in a “champion” group and bottom eight clubs are playing in a “relegation” group. Each team plays seven more games in the second phase (1-4 and 9-12 teams will play four times at home) and they will start the second part of the competition with half the points (rounded up) achieved during the first phase of 30 matches. The champion is a club with the most points in the “champion” group after 37 games. 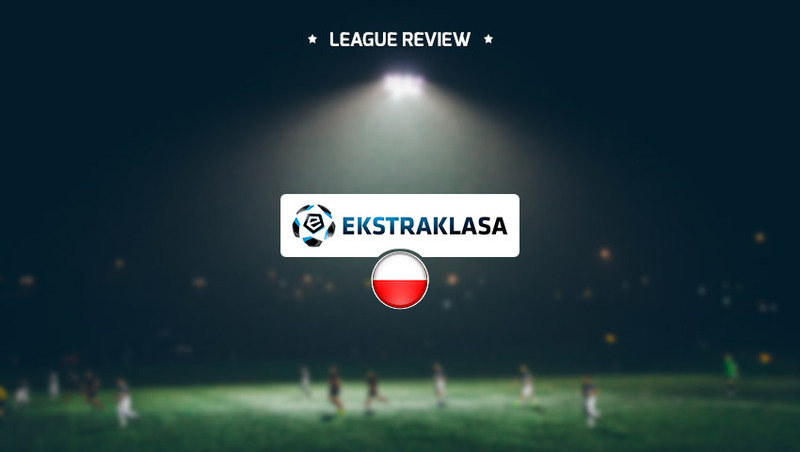 Polish Ekstraklasa is one of the most interesting league championships in Europe in which the champion is usually crowned in the last round. Last year Lech Poznan became league champion with just one point lead against Legia Warsaw, the most successful club in the last couple of years. Jagiellonia Białystok came third just two points behind Lech. This year the situation is a bit different. After the split of the championship into two parts Legia is first in “champions” group with 3 points advantage against Piast and 9 points advantage against Pogon Szczecin. As mentioned Legia is the most successful club in Poland in last years and they are the main candidates to become champions this year. They have by far the most expensive team in Ekstraklasa and they arguably have the most quality team in the league as well. They have some players who are playing in the Polish national team on their roster while their most expensive players are Slovak national team player Ondrey Duda who plays as an attacking midfielder and Nemanja Nikolics, a Serbian-born striker that plays for the Hungarian national team. Polish league is one of the most physically difficult leagues to play in, the games are based on fast rhythm and a lot of running. Teams are very good in their defensive duties and there is little space left for players to exploit. The average age in Ekstraklasa is 26.1 years which means that the clubs have a mixture of young talents and experienced players. A lot of Polish young talents leave Ekstraklasa when they are teenagers, such as Wojciech Szczęsny, Arkadiusz Milik or Grzegorz Krychowiak while some choose to stay in Poland until they’re 22-23 years old and are already complete footballers, such as Robert Lewandowski or Jakub Błaszczykowski. When we talk about The Ekstraklasa we can’t leave out the very passionate fans all over the league, who create fantastic choreographies game after game. There are some downsides of that too because Poland has a lot of problems with hooligans, but in last years, this is more or less under control. Many sports teams in Poland have organised supporter groups that are actively involved in either the ultras scene or the hooligan scene. All these groups have 4 types of relationships between each other which are subject to change over time – friendships, agreements, enemies or neutral. These relationships can be complicated. However, local derbies are usually pre-determined by historical and geographical factors and very rarely local derbies are not considered to be a fierce rivalry. In some cases, the rivalries extend beyond sport and are general rivalries between cities or towns. There are too many rivalries to count them all, but the biggest rivalries are for sure those between Legia Warsaw and either Lech Poznań, Widzew Łódź or Wisła Kraków. All four clubs are among the most supported in the country and usually are or were among the title contenders. The animosity towards Legia stems from the fact that Warsaw is the capital city and are perceived to be the favoured by the authorities.